I seem to remember the late Roy D’Aquilla, Charles Leary and Vaughn Perret yammering about those lot assessments at Trout Point on May 24, 2010 in a document I obtained from Leary and Perret’s SLAPP suit against Fox 8 in Nova Scotia Canada. These SLAPP happy nut jobs were so brazen they laid themselves bare in that case in Canada, never thinking anyone would make the connection to what they were doing in Louisiana. Clearly they have underestimated the new media as there has been one media outlet in New Orleans with the cojones to tell this part of the Jefferson Parish corruption saga, Slabbed New Media. Drew Broach has the legal context for the legal filing while Vaughn Perret was seen late last week braying about Ferry Service to Yarmouth. The Canadian media including the Chronicle Herald and Toronto Star have whiffed on this story badly, no doubt due to their country’s piss poor free speech protections and lack of SLAPP suit protections. Finally I know many of you are wondering how these latest revelations will impact my court case against Leary, Perret and Trout Point Lodge. The answer it it won’t as Judge Guirola now has the case. I can not comment further as legal has me muzzled but for those wondering about the last 2 briefs filed in the case here is mine and here is the Goatherders as filed by Jones Walker Attorney Henry Laird. I don’t understand the muzzle. Screw the lawyers. Let loose the dogs of hell! In due time Carpe. I’m sprucing up the cockroach motel portion of the Do Slabb Inn as we speak. Next week I will apply sunshine to scatter these cockroaches, then after I gather up all the filthy creatures I’ll post same to Slabbed. 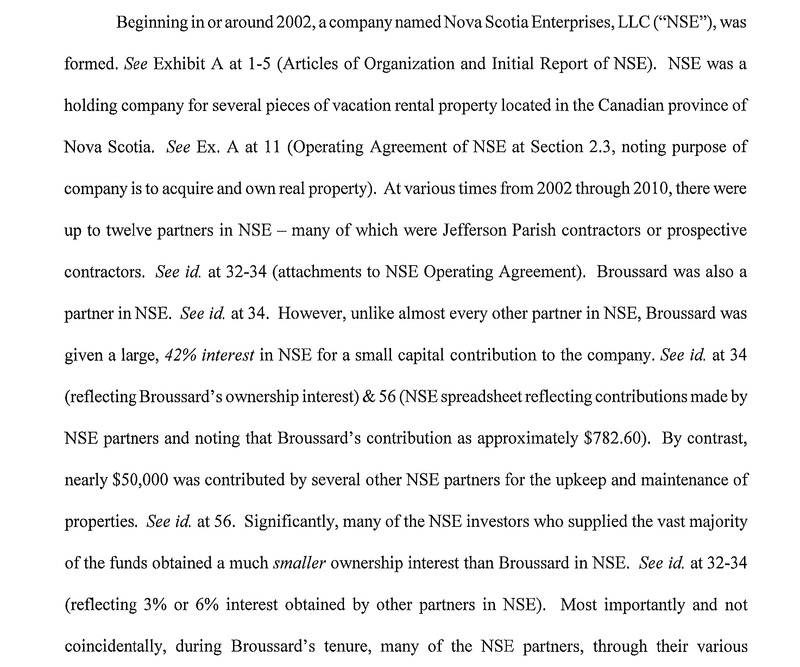 Is that your daddy and mama that bought Aaron Broussard’s land in Nova Scotia? Where are you Nick? Metairie? Kenner? Texarkana? San Jose? The tables have turned show no quarter have no mercy! Notice the names of Broussard’s co-conspirators were redacted from the court exhibit? If I were them I would not go down with Broussard, Leary, Perret and Danny Abel. We need to flesh this whole deal out again because you gotta figure Peter Butler’s name was one of the redactions. A fair question to ask is how many of those people high tailed it to Letten’s office last January to save their own skins and are now cooperating with Team Letten. Do you recognize any of the following names? Are you in Nova Scotia? If you are, do you ever visit with V and C? Aaron Boussard paid his Mardi Gras parade dues to Bacchus, Argus and Endymion out of his campaign funds as the Feds’ exhibited checks clearly reveal. Now what is the difference from Mardi Gras parade dues compared to massive amounts of Mardi Gras parade equipment that our honorable Chrissy “King of JP Campaign Funds” Roberts has paid hundreds of thousands of dollars for out of his campaign funds especially in non-election years ? Whitmergate has mentioned quite often the infamous run down of Chrissy’s parade equipment here before and all Slabbers are familiar with the list. by the way the initials of the lodge are the same as your employer, TP. nova scotia? lodge? whats the matter steph, ‘fraid of getting sued?. just come out and say it already. A stinker of a column she posits on her way out. Jr, her last day is the end of the month as she evidently did not agree to the demotion. After reading Ms. Grace’s Broussard empathy plea article, it looks as though she and Aaron may have had a reunion rendezvous at Antoine’s. Next Next post: Sunday Music reader request.